It is time for another Christmas giveaway from ChristmasGifts.com! So don’t hang your wreaths on your doors just yet, because you might win a new one! 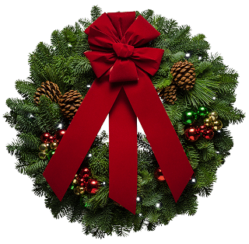 One lucky winner can receive this gorgeous and luscious fir and pine wreath from Christmas Forest. If selected, you will be lucky enough to win a handmade wreath from a company that has been crafting breathtaking Christmas wreaths since 1976, and you won’t just be winning any wreath. You will be winning their most popular wreath! See the contest instructions below to learn how to win! This wreath really does embody Christmas spirit entirely. It is made of noble fir and princess pine, adorned with pale yellow incense buds and pastel blue juniper berries, all topped with a beautiful big red bow! It measures twenty inches, and is ready to be shipped to your door where you can proudly display it, and bring Christmas cheer to all who see! This wreath will welcome all guests with holiday spirit, and put a smile on the faces of passersby, spreading Christmas warmth to everyone. Learn how you can snag this gorgeous wreath for yourself! Go to ChristmasGifts.com and choose a product you like. Click on that product. Scroll down to the “share this” section under the product and share the product on your favorite social media account, i.e. Facebook, Twitter. Then copy and paste the link of the product on our Facebook contest post. https://www.christmasgifts.com/women/custom-photo-collage-blanket. What a beautiful gift this would be. I would love to win this beautiful wreath to hang on my door. Thanks for the chance, Merry Christmas!